New in 2011 - Upgraded Architectural Lighting! The Settlemier House now stands out prominently on Settlemier Ave, even at night! Welcome to The Settlemier House! 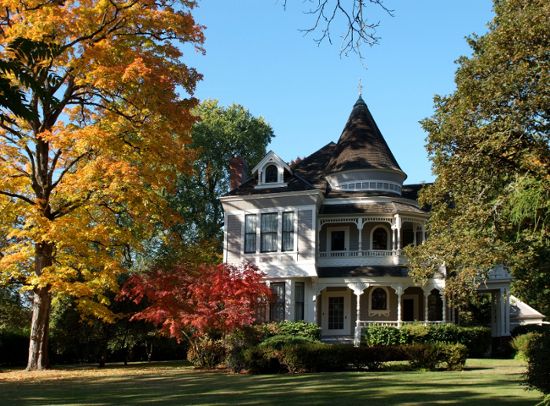 The Jesse H. Settlemier House is an 1892 Victorian/Craftsman Home located on nearly 3 acres of beautifully landscaped grounds. The backyard is surrounded by a hedge, and features a gazebo offering a private setting for an outdoor event during the spring, summer and early fall months. The House was recorded in the National Register of Historic Places in 1974. Tours are offered the 1st Sunday of each month and are open to the public. The House is also available as a rental for weddings and other special events. 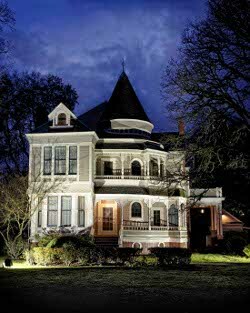 The Settlemier House is located at the intersection of Garfield and Settlemier Avenue, in the heart of Woodburn, Oregon. For directions to the House, click here to view an interactive Google® Map. A beautiful fall day in Woodburn!